The Heart and soul of a vessel is its main engine – the sole means available and responsible for movement of vessel from one point to another, allowing it to counteract the effect of current, wind , tide and several other external factors. As stated in COLREGS 1972 regarding the use of engines and STCW 2010 guidelines for Bridge watchkeeping, duty officers need to be fully aware and conversant with various bridge control systems and use of main engine. This know-how is essential in order to deal with emergency or critical manoeuvre wherein a thorough understanding of various alarms and indicators is required. 1. Check Communication Systems: The first and the foremost important thing before using main engine is the communication between the Bridge and the Engine Control Room or the local manoeuvring platform. The fixed communication system, hand powered telephones, talk back system, walkie talkies if used should be checked and ensured in good working order at all times. Communication forms the basic and primary ingredient for starting and further operating main engine smoothly from any designated location. 2. Clear The Propeller: Before trying out or operating main engine it must be ensured that the propeller is clear of any nets , fishing lines , ropes , trawls or any other unwanted objects. Often while vessel is stopped, lying at anchor, berthed alongside a pier, jetty or berth or moored at single point mooring there are tug ropes in water or fishing nets or broken lines floating, which might get entangled in the propeller fins and damage it. Hence it’s important that such things are cleared before rotating the propeller. 3. Make Sure Engines Are Tried From ECR Before Taking Over: It is very important to ensure that the propulsion plant is in good condition so that no trouble is faced when the engine is running during manoeuvring. This can be better done by engineers who can assess the clear picture if the engine is tried for ahead and astern from ECR before transferring the controls to the bridge. 4. Test The Telegraph Transmitter: Before actually operating the Main Engine, the telegraph transmitter from the bridge is being tried out with the engine control room and its operation confirmed at both locations for starting, stopping, reversing and speed setting provided. All the indicators and push button switches, all lamps and buzzers on the main engine telegraph panel must be tried out on every occasion before commencing manoeuvring or starting the main engine. 5. Transfer the Controls and Check Indicator Lamp: The controls for operating the main engine must be provided or transferred through the command switch on the bridge telegraph panel. While changing over the control position to bridge from control station, operate the telegraph transmitter so that the indicator lamp of handle match position lights up. A navigating officer must be aware of the emergency starting interlock if the emergency shutdown is in non-operating condition. 6. Put Telegraph Transmitter Into Operational Position in Harbour Passage: During harbour passage for operating the speed control of Main Engine, telegraph transmitter can be put into optional position. The main engine speed corresponding with that position is set due to governor control. The position of telegraph transmitter is set into centre of each instruction slot; however engine speed can be changed by putting it into every other position. 7. Control Acceleration Of Main Engine Gradually When Telegraph Put Into NAV FULL:When the telegraph transmitter is put into NAV FULL position, which is at the starting position of load program, the acceleration of main engine is then controlled gradually and not instantly as per the moved position of the telegraph transmitter. Indicator lamp of LOAD PROGRAM lights up during this command. For reducing the speed of Main engine, the telegraph transmitter is moved more than from starting position of load program for reducing from NAV FULL . 8. Use PROGRAM BYPASS For Instant Reduction Or Acceleration: In case where situation demands instant reduction or acceleration of Main Engine from NAV FULL, a PROGRAM BYPASS switch is provided. Upon being pressed it will by-pass the LOAD PROGRAM for reducing or increasing the revolutions and would thus bring the main engine speed instantly to the desired position set by the Telegraph Transmitter. By pushing again the PROGRAM BYPASS switch the normal operation can be restored. 9. Know Manual Emergency Shutdown Procedure: Manual Emergency shutdown of a main engine is provided generally at following locations e.g. Bridge, Engine Control room and the Engine side. Manual emergency shutdown can be operated from any of the positions regardless of the control position for operating the Main Engine. 10. Automatic Emergency Shutdown Operates Irrespective Of Control Position: Automatic Emergency Shutdown is provided for safety in case of Overspeed and few other parameters exceeding permissible limits for a preset period of time. Once Automatic Emergency Shutdown is activated, the alarm of EMERGENCY SHUTDOWN is given and the indicator lamp flickers on the Main Engine operating panel. Automatic Emergency Shutdown too operates irrespective of the control position. In our previous article (part-1) of the series, we learnt about few basic procedures, steps and terms which deck officers must know regarding ship’s main engine telegraph panel and its various alarms and functions. In this article, we will be discussing them in further detail with regards to main engine’s interlocks, starting procedure, resetting and fault finding. 1. Constantly Monitor Engine Load In Rough Weather: While operating in rough weather and heavy weather areas, engine load should be constantly monitored. Stern swell often causes the propeller to emerge out of water for fraction of seconds during the time period of swell. Thus a reduction in resistance near the propeller results in racing of the propeller and a surge in the load on the main engine. 2. If Remote Control Fails, Transfer Control To Engine Room Immediately: If remote control operation becomes inoperative or unavailable by accident, the control position should be immediately changed or transferred to the engine side. Control cannot be changed over if start air main valve is not in service mode or auxiliary blower is not in auto position. 3. If Main Engine Stops, Move Manoeuvring Handle To STOP Position: If main engine stops due to emergency shutdown or automatic shutdown device, always first move the manoeuvring handle in control to STOP position to ensure the safety of the vessel. In case of failure of the remote control system, manual and automatic shutdown devices are provided to enable shutdown of the engine in case of any abnormality. 4. To Reset Emergency Shutdown, The Telegraph Transmitter On The Bridge Must Be Put To STOP Position: In case of an automatic emergency shutdown it must be borne in mind that main engine is automatically shutdown by fuel cut-off due to overspeed, low lube oil pressures, high temperatures of thrust pad. For resetting an emergency shutdown the telegraph transmitter on the bridge must be put into STOP position and Emergency stop button should be pressed in the control room to reset it. Real Life Accident: While a container vessel was crossing a traffic lane in the Singapore straits to reach the Pilot boarding point, the duty officer noticed a Automatic Emergency Shutdown alarm. The Master noticed the CANCEL AVAILABLE indicator was lit. The vessel was in heavy traffic congestion area and in a critical manoeuvre. Master thus cancelled the automatic emergency shutdown by pushing the AUTOMATIC EMERGENCY SHUT DOWN CANCEL switch and kept running the engine in abnormal condition for some time before the vessel safely anchored in a safer zone. Thus engine was being run in abnormal condition for some time considering Safety of Navigation and Life. Mostly the CANCEL switch is effective only in bridge control. Many classification societies have manifested this in their specifications. 5. Auto Emergency Slow Down Alarm Can be Cancelled To Keep Engine Running: AUTO EMERGENCY SLOW DOWN ALARM for the main engine functions similar to the AUTO EMERGENCY SHUT DOWN and thus same can be cancelled if required by the circumstances, which keeps running the engine as per telegraph order and does not slow it down. 6. Check Start Air Valve or Auxiliary Blower Position In Case Of Alarm While Changing Over The Engine Controls From Control Room: While changing over the engine controls from control room to bridge if any difficulty or alarm is observed, it can be mostly due to inappropriate position of start air main valve or auxiliary blower in any other position other than AUTO. 7. Imperfect Bridge Control Condition Alarm is Mainly Due To Inappropriate Position Of Start Air Main Valve Or Auxiliary Blower: If there is an alarm IMPERFECT BRIDGE CONTROL CONDITIONS, it can be mostly due to inappropriate position of start air main valve or auxiliary blower in any other position other than AUTO or due to abnormal condition of bridge control air pressure. While stopping and starting main engine it must always be kept in mind that a limited number of starts can be made with the charged air bottles for start air. 8. Follow All Steps While Removing Starting Interlock For Main Engine Fuel Oil Supply: For removing starting interlock for Main Engine fuel oil supply to be restored, turning gear should be disengaged and emergency shutdown should be in operational state. This is a safety feature provided in the main engine to prevent any operational mistakes while starting the main engine. 9. Miss Ignition Restarting Take Place Automatically: When main engine keeps running for a preset time between lower and upper limits of critical speed range the alarm CRITICAL SPEED RANGE will light up. The term MISS IGNITION is used when the main engine speed drops lower than ignition level speed after the main engine is changed into fuel running. For miss ignition restarting will be automatically made. The indicator lamp REPEATED START lights up during restarting. 10. Be Careful If Main Engine Is Set To Limited Revolution Value: If main engine is set to limited revolution value by a ten key in Control Room Control Panel, then the engine can be accelerated not more than the upper limit of the set revolution in case of bridge control. In such case if telegraph transmitter from the bridge is moved to more than the position for limited revolution the indicator LIMITED SPEED lights up. 11. Whenever starting operation is interrupted START IMPOSSIBLE ALARM is given. This can be reset my moving the telegraph transmitter to stop position. What exactly happens when crash astern is applied ? While the ship’s main engine is running into ahead position, the telegraph transmitter is put into astern position. Fuel gets cut off due to difference between running direction of main engine and telegraph transmitter. As the speed drops to reversing level, the braking air is supplied. The main engine is then reversed and accelerated to astern ignition level. Starting fuel supply is started and start air is cut off. Thus eventually the engine speed matches the telegraph transmitter position. 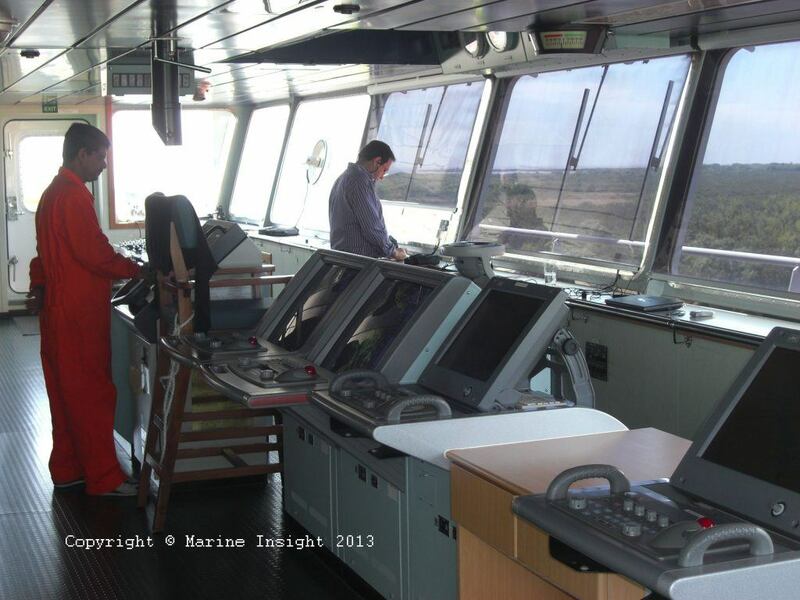 Controlling the main engine from the bridge requires several important aspects and technical features to be considered by the ship’s deck officers. The above mentioned points are not exhaustive and must only be taken as reference while handling navigational controls at the ship’s bridge.